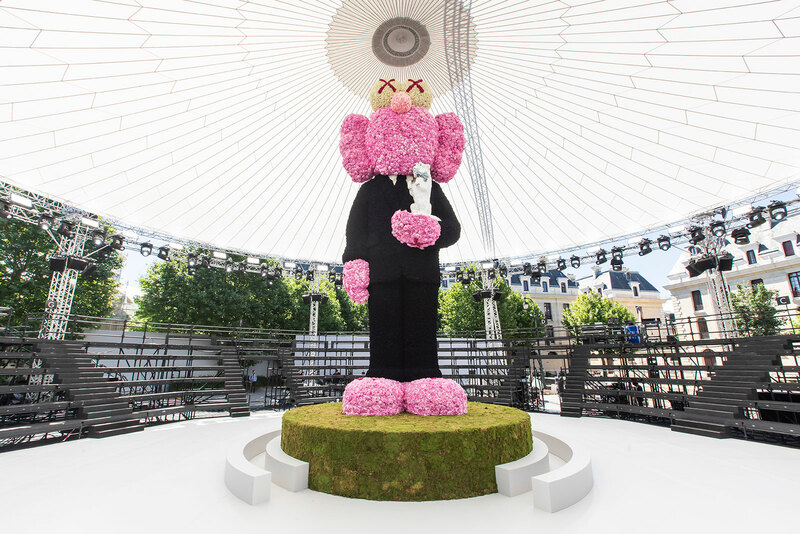 A cartoonish effigy of Monsieur Christian Dior constructed from 70,000 peonies and roses; a Dries Van Noten catwalk resembling an extravagant never-ending banqueting table; a Moncler snowscape appearing as a colourful alpine scene reflected through the lens of a kaleidoscope. These are only three of over 800 examples of the sensational runway spectacles orchestrated by renowned Belgian show producer Etienne Russo. A conductor-like figure, Russo fine-tunes the many facets of a fashion show, be it set design, music, lighting or model choreography – uniting these disparate elements into a sublime multisensory crescendo. These are the moments that audiences on the front row, or behind the screen of a phone, remember for years to come. Russo founded his Brussels-based special events and show production company villa eugénie in 1995, and over the last two decades he has nurtured an impressive client list, bringing the creative visions of brands such as Chanel, Kenzo, Moncler, Miu Miu, Hermès and Givenchy to life. But it was in 1991, when the then burgeoning fashion designer and fellow Belgian Dries Van Noten, asked Russo to swap modelling in his shows for helping him design the sets, that his career in creative production was born. Quick thinking and problem-solving are synonymous with the success of creative production, where set design, music or lighting issues can present themselves up to the minute before a fashion show’s start time. His long-time collaboration with Dries Van Noten has produced some impressive feats of ephemeral mise-en-scène. Take the brand’s S/S 2005 womenswear show held in celebration of its 50th collection, for which he staged a banquet for 500 people, with twinkling chandeliers lighting up one long table which transformed into a runway. Or the 48-metre long carpet by artist Alexandra Kehayoglou, which resembled a mossy forest floor and took four weeks to create. Russo laid it along the catwalk for the brand’s S/S 2015 women’s show, which was inspired by John Everett Millais’ Pre-Raphaelite masterpiece ‘Ophelia’. For A/W 2018, Moncler’s personality was at an all time high, when the brand unveiled its monumental Genius Project at the Palazzo delle Scintille in Milan. Russo has created some incredible fashion shows for the Italian outerwear house, another of his long-time clients, including a ‘Doctor Zhivago’ inspired winter ball at the New York’s Hammerstein Ballroom for Moncler Grenoble A/W 2017, and a flash mob at Manhattan’s Grand Central Terminal for Moncler Grenoble A/W 2011. For Moncler’s Genius showcase, Russo was enlisted to realise the diverse creative visions of the roster of designers asked to reimagine its classic down jacket, including Craig Green, Simone Rocha and Valentino’s Pierpaolo Piccioli. ‘It was like producing eight different shows simultaneously,’ he says. The label’s enormous venue featured different presentation spaces secreted behind silver fabric; Craig Green’s eerie underwater world, Simone Rocha’s papery mountain landscape and Pierpaolo Piccioli’s ecclesiastical environment were housed beneath.